A beach tent or sun canopy serves a variety of purposes for providing you, your family, and friends with a sun shelter. Many beaches don’t have any places where you can find shade so bring a beach tent will provide much needed shade when you need it, extending your day at the beach. We have researched all the options for beach tents, with sun protection, portability and durability as the highest priorities, and recommend Pacific Breeze Easy Setup Beach Tent as your best option. 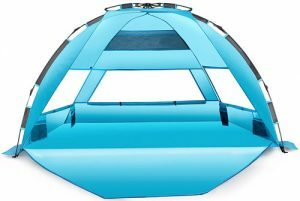 In addition to our best beach tent pick, we have identified some other sun shelters for specific needs such as the best baby beach tent, the best pop up beach tent, and the best beach umbrella tent. Many public beaches have guidelines for beach tent rules, before you make a purchase decision, make sure to understand the rules of your beach. The Pacific Breeze Easy Setup Beach Tent is the best combination of sun protection, portability, and durability available. This sun canopy has a specially designed hub system providing for the easiest setup and take down of beach tents for sale on the market today. With UPF 50+ sun protection, it offers great shelter from the sun. Weighing just 4.5 pounds and folding down to a travel size of 40″ L x 5″ W x 5″ H, it provides the portability we like. It includes a durable and lightweight fiberglass frame and water resistant PE floor providing the durability we expect from our top pick. Specific features of the Pacific Breeze Easy Setup Beach Tent include: Setup dimensions of 87″ L x 47″ H x 49″ D (again, check your beach if this size is in regulation). Made from breathable polyester and is water repellent. A spacious interior shelter and has internal pockets to store personal items. Includes sand pockets, and stakes to help keep the tent from blowing away on breezy days. If you are looking for a beach tent for babies, this sun canopy should be your top pick. 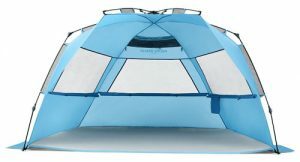 The MonoBeach Baby Beach Tent is not only easy to setup and take down, but it is also a perfect size for travel (it can even fit in a suitcase), it is durable, offers great protection from the sun, and it is versatile. With an included baby beach pool built into the floor of the tent, your baby can start enjoying the water without worrying about crashing waves from the ocean. In addition to the above, the features of the MonoBeach Infant/Baby Beach Tent are: UPF 50+ sun protection. Open size: 47.5″ W x 31.5″ D x 27.5″ H. It includes a nice travel size carry bag and 4 sand stakes to help keep it anchored on breezy days. For ventilation, there is a screened window that closes securely with velcro when not in use. The bottom floor of the tent can be zippered off, but many owners of this tent opt to fill the baby pool with either sand or water for the baby to play in. If you are going to use this baby beach tent with the floor, it is recommended that you dig a shallow hole in the sand so when you place the tent over the hole, the pool has room to drop into the sand. If you are looking for a more traditional baby beach tent with great privacy, the Schylling UV Play Shade might be a better option for you. 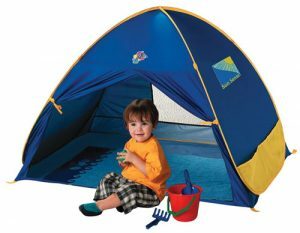 This baby beach tent is also a good choice for babies who need a bit more of a darker beach tent to sleep in. 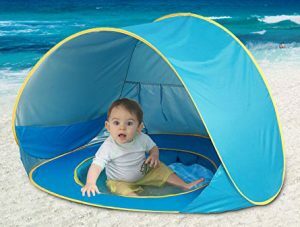 With the highest possible rating of SPF 50+ this beach tent for babies is well built and a great value. The solid color sides of this tent make it not only a safe beach tent for babies to sleep in, but it’s also possible for moms to enter the tent and breastfeed. In very hot weather, this tent can get a little stuffy even with the large screen window. We recommend a small clip on tent fan like the: O2COOL 5-Inch Battery Operated Clip Fan. For more tent fan options that can be used batteries at the beach, see our Best Tent Fan article. 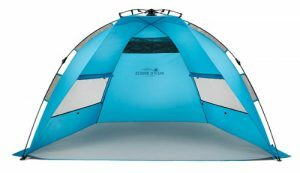 Other features include: Tent setup size: 31″ H x 51″W x 39″D. Instant Pop Up design. Waterproof Polyester. Includes on the go carry bag. Also includes tie down pegs and sand pockets to keep it securely in place where ever you are. If you are looking for a pop up beach tent, the Pacific Breeze Beach Tent Deluxe XL is a great option. The Deluxe XL version is a bit larger than our top pick so choose this option if you are looking specifically for a pop up beach tent that has a lot of room. With UPF 50+ sun protection, it offers great shelter from the sun. Weighing just 6 pounds and folding down to a travel size of 38″ L x 6″ W x 6″ H, it provides the portability we like. It includes a durable and lightweight fiberglass frame and water resistant PE floor providing the durability you need. Specific features of the Pacific Breeze Beach Tent Deluxe XL include: Setup dimensions of 95″ L x 51.2″ H x 51.2″ D (again, check your beach if this size is in regulation). Made from breathable polyester and is water repellent. A spacious interior shelter that can fit 3-4 people and has internal pockets to store personal items. Includes 5 sand pockets, and stakes to help keep the tent from blowing away on breezy days. The Arcshell Premium Pop Up Beach Tent is another large sun canopy providing shelter from the sun. 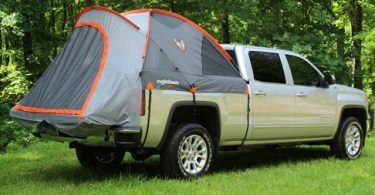 We added this particular beach tent because of it’s versatility in that the extended front floor mat actually zips up to create an enclosed tent. When the floor extension is zipped up as well as the window flaps, it creates a completely private beach tent. Some other features that we like are the instant pop up design, large screened windows for air flow and ventilation, interior storage pockets, and carry size. Specific features of the Arcshell Pop Up Beach Tent include: Setup dimensions of 94.5″ L x 52″ H x 51″ D (again, check your beach if this size is in regulation). UPF 50+ sun protection. Made from breathable polyester and is water repellent. 4 storage bags sewed on the 4 interior corners of the tent and 1 large storage bag sewed on the internal upper part of the back wall for storing larger sized items. Includes 5 extra-large sand pockets, and stakes to help keep the tent stable in up to 25 mph winds. 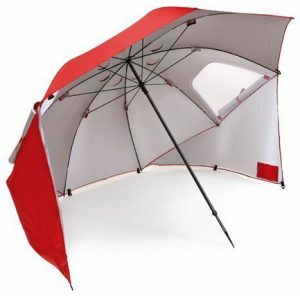 The Sport-Brella Beach Umbrella Tent is a hybrid between a stand up beach umbrella and a beach tent. This beach umbrella has a long umbrella stake like you would normally see on a beach umbrella, but it also includes 2 side panels that can be staked into the sand or the ground offering some extra stability on windy days. The features of this beach umbrella tent include: Rugged umbrella structure with side flaps for full cover protection. Top wind vents and side zippered windows for efficient airflow. Maximum sun protection UPF 50+ and water repellent, Protects over 99.5% of UVA and UVB rays. Internal pockets for stakes, valuables and gear, Includes convenient carry bag plus tethers and ground stakes for extra stability.